Holy Family School is celebrating 57 years of Catholic academic excellence. 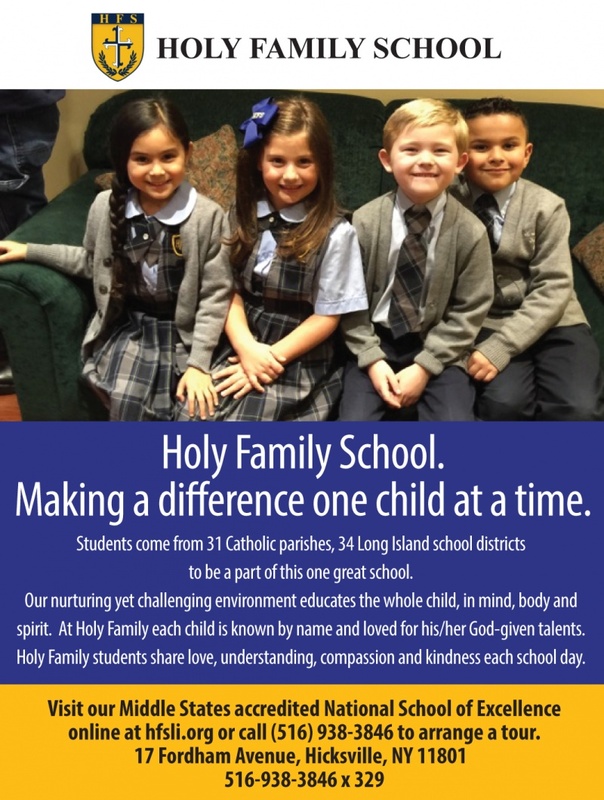 The students that attend Holy Family School come from 31 Catholic Parishes and 34 Long Island School Districts. Their cultural, economic, and academic diversity gives a beautiful personality to our school family, similar to what one would find in a loving family. Each student is known by name, and loved for his or her God-given gifts and talents. The faculty, staff, and administration of Holy Family School take very seriously the sacred trust parents place in us when they leave their children in our care. We strive to be an extension of their home and family life by ensuring that the beliefs, values, and morals that are aligned with our faith and their family are evident in all we do as a school family. The underlying theme for all Catholic Schools is: “Communities of Faith, Knowledge, and Service”. At Holy Family School, we live that theme, while simultaneously adhering to our personal tagline: “making a difference, one child at a time”. We at Holy Family School are proud to say we are growing in student population and in academic success. We are considered a National School of Excellence; we are Middle States accredited, and we won the title of Best of Long Island. Mrs. Maryalice L. Doherty is in her sixth year as Principal of Holy Family School. Prior to coming to Holy Family, Mrs. Doherty was the Assistant Principal at Maria Regina School in Seaford for five years. She served as Principal of The De La Salle School in Freeport, taught Pre-K at Saint Ignatius Loyola School in Hicksville and Special Ed Kindergarten at Northside School in Levittown. She began her career as a Student Teacher at Saint William the Abbot School in Seaford in 1979 and she remained there teaching fourth and second grades until 1987 when she had her first child. Mrs. Doherty has worked with the Education Department in the Diocese of Rockville Centre coordinating the National Growing Healthy Program, the Health Education and Prevention Program, The Second Step Program, and general Health Education in Diocesan Elementary Schools for the past 21 years. Mrs. Doherty is married with a daughter and a son. Both of her children were educated in Catholic Elementary School, Catholic High School and Catholic Colleges. She believes she was born to be a mother, a wife, and a Catholic School Educator, and she truly loves being all three! Come see if Holy Family School is the right choice for your “family”. visit our school at any time. Join us for an open house on Thursday, April 4. Prospective families are invited to come between 9am-1pm and again from 4-8pm.